This entry was posted in vizz on 30/11/2007 by osde8info. Use vcbMounter to snapshot your live VMware VM which will call /usr/sbin/pre-freeze-script just BEFORE creating the snap and /usr/sbin/post-thaw-script approx 1 second AFTER the delta/diff/redo file has been created BUT before the original VMDK has been been exported via vmkfstools. # time the VMware Tools are installed. This entry was posted in vizz on 28/11/2007 by osde8info. To get the most out of your VMs and backup and restore them in the most reliable way you must install VMware tools in your guests. As well as providing better mouse & video drivers it provides an API to the host providing IP, clock information and installs VM startup, VM shutdown, VM freeze & VM thaw scripts /usr/sbin/pre-freeze-script and /usr/bin/post-thaw-script. This entry was posted in vizz on 27/11/2007 by osde8info. This entry was posted in vizz and tagged vmware on 26/11/2007 by osde8info. Here’s a CentOS 4 VM with 4 snapshots, in each snapshot I added a 40M file and in two of the snapshots i snapped the memeory as well. 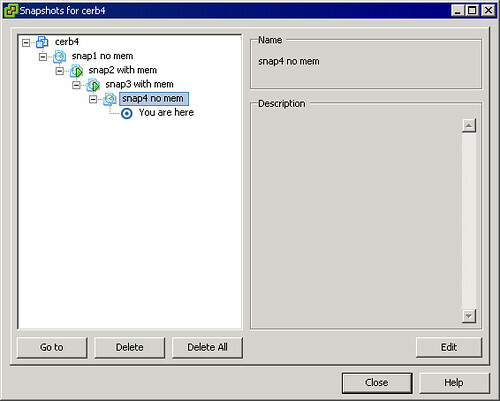 Note a memory snapshot file is ALWAYS created if it doesn’t contain anything ! The .VMSD contains a snapshot definition ! This entry was posted in vizz on 26/11/2007 by osde8info.